Manufacturing - Gemini Chokes | Winshoot s.r.l. Turning and milling operations, performed for the production of Gemini choke tubes, are carried out using modern numerical control machines, very precise and reliable machinery. The whole manufacturing process is steadily monitored with scrupulous on-board machine control systems and at the end of the production cycle. Particular attention is paid to finishes including external grinding, for less roughness and micrometric tolerances, and internal lapping, to ensure that the choke performs the same sliding of the barrel. Lastly, to facilitate immediate identification, each piece is laser-marked specifying model, constriction size and use: Steel Shot (all ammunition) or Lead Only (lead only). The bedrock of the excellent performances boasted by our choke tubes are the materials they consist of. We have chosen to manufacture our products mainly in 42CrMo4 steel alloy, with the exception of thin-walled chokes for which we prefer 17-4 PH stainless steel. Finally, for those looking for a product of the highest level with a minimum weight in sport shooting, we use Ti 6AI-4V (grade 5) titanium. Let us discover these materials and coatings, as well as the treatments they undergo in order to further improve their performance. Approximately 80% of Gemini choke tubes are made of 42CrMo4 alloy steel (EN 10083-3), which is the most widely used steel in this field, thanks to the excellent quality / price ratio that it is suitable to boast. This material shows off a hardness ranging from 800 to 900 N / mm², with the right balance between hardness, mechanical strength and toughness, it is also "normalized", i.e. it undergoes a specific heat treatment that allows it to achieve a perfect microstructural equilibrium. The pieces, once finished, are subjected to Nickel-plating (as for internal choke tubes) or Nickel-plating+DLC (as for all other models), which is displayed below. AISI 630 steel, also known under the trade name of 17-4 PH, is suitable to achieve excellent balance between mechanical strength and corrosion resistance; it reaches the optimal level of these characteristics following a specific heat treatment that it undergoes at the end of processing, solely very few companies show off the accuracy to carry out such a critical but fundamental stage. 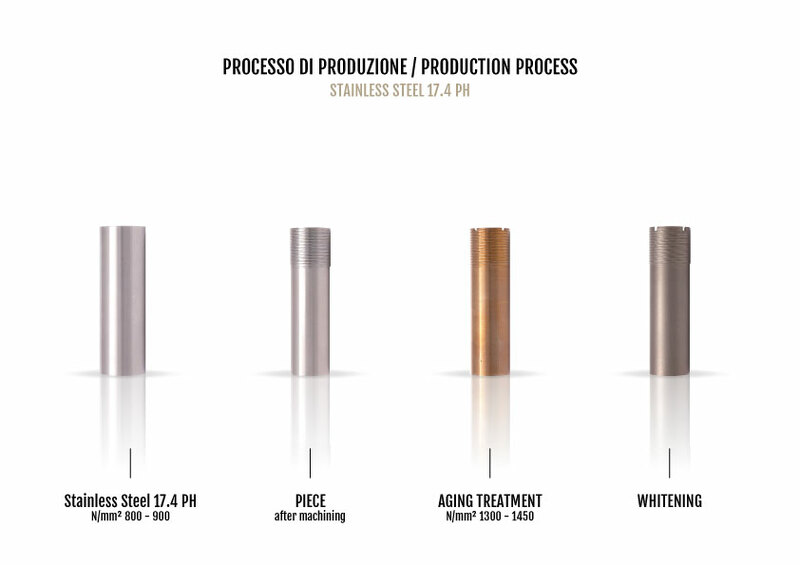 This treatment known as "precipitation hardening" or "aging hardening" increases the hardness up to 1300-1450 N / mm², no less (against the initial 800 N / mm²) without any deformation. 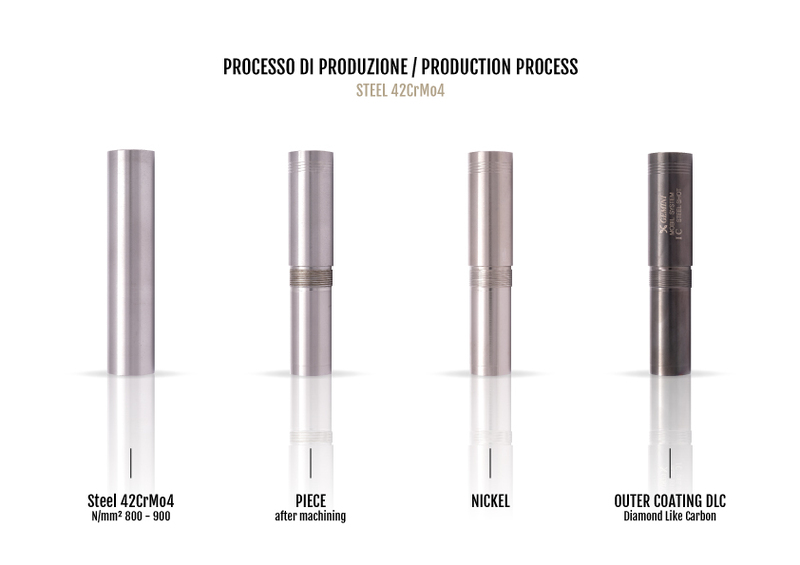 We prefer the use of 17-4 PH steel for the realization of our thin-walled chokes. These pieces are not subjected to any subsequent Nickel or DLC coating, yet they are simply bleached. The hardness reached by the material following such treatment allows us to employ it with high coating mass ammunition and also the use of steel shots (only as for cylindrical constriction size). 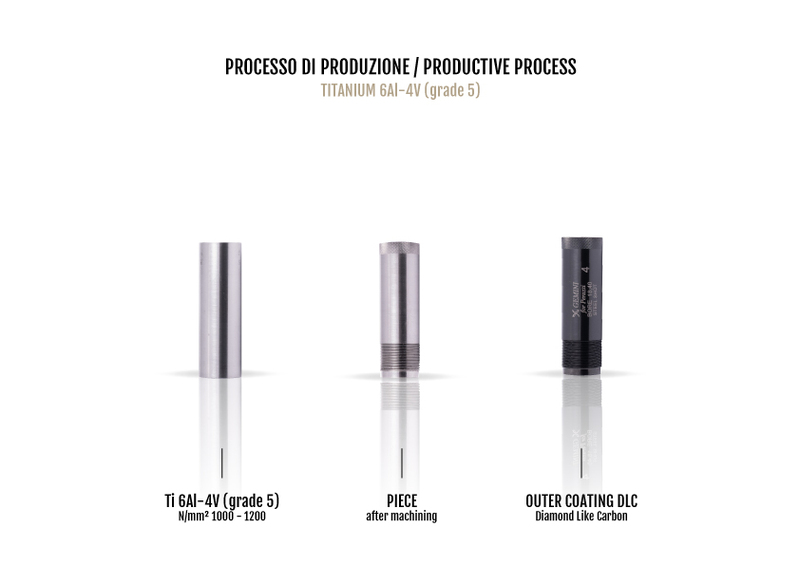 Ti 6AI-4V (grade 5) titanium. Known as the "strong suit" among titanium alloys, Ti 6Al-4V is the most commonly used one. It represents 50% of total titanium consumption worldwide. Such alloy is featured with high strength (900-1200 N / mm²) combined with an absolutely light weight, good formability and high corrosion resistance. Certainly the best application is that for shooting choke tubes, it is used by enthusiasts and professionals who need or aim at having little (very little) weight at the muzzle end. The choke tubes made in titanium are subjected o DLC coating. Given the refined material with which they are realized, they boast a price necessarily higher than the average one in the catalogue. What coatings are undergone by choke tubes made of 42CrMo4 alloy steel, 17-4 PH stainless steel, Ti 6AI-4V (grade 5) titanium? As for internal choke tubes it is performed exclusively Nickel-coating, while for all the others Nickel + DLC coating is also carried out, let's see what it consists in. Such coating is called medium-phosphorus electroless nickel-plating (5-9% in P). It is the most widely used among Niplate coatings, thanks to its high wear resistance, good corrosion resistance and low friction coefficient. It conveys a hardness of 700 +/- 50Hv after dehydrogenation at 160-180 ° C for four hours. Nickel plating avoids the oxidation of the pieces and is carried out on all choke tubes in 42CrMo4. The DLC technical coating (Diamond Like Carbon) gives the choke tubes an appropriate colour and avoids annoying reflections, which could render the firearm visible. The DLC is a coating in "Amorphous Diamond" providing the choke tube with additional hardness (2500-3000 Hv), extraordinary abrasion and wear resistance, a low frictional coefficient (smoothness and anti-adhesion) and excellent chemical inertness. We can not unveil the whole "tricks of the trade", yet we were willing to share with you some information that shall help you to choose your shooting partner more accurately. Many of the displayed treatments and the finishes undergone by our pieces are, for our company, a great waste of time and money ... nevertheless this is the only way to guarantee a safe, high-level and absolutely performing product. For us quality comes first, as well as your satisfaction when using a Gemini choke tube!